Windows 10 is deployed in more and more companies. 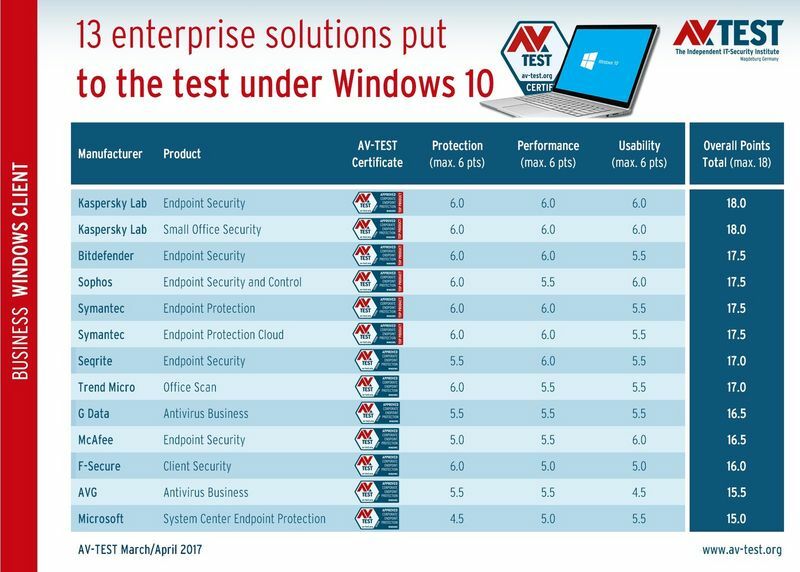 The laboratory of AV-TEST tested 13 corporate solutions for Windows 10 in terms of their protection, performance and usability. The results are impressive. 6 out of 13 products even achieved excellent overall scores of 17.5 and 18 points. The market shares of Windows 10 are steadily increasing. In Europe and the United States, the deployment percentages of Windows 7 and Windows 10 are currently neck and neck at roughly 30% each. Because the deployment of Windows 8 is already well below 8%, the laboratory of AV-TEST placed the focus on Windows 7 and 10 in its test series for corporate solutions. Throughout the months of March and April 2017, the lab tested 13 client-server solutions for corporate users under Windows 10. In both months, the solutions were tested in the categories of protection, performance and usability. In all categories, the laboratory awards a maximum of 6 points. Thus, the top score achievable is 18 points. The products of Bitdefender, F-Secure, Kaspersky Lab and Symantec detected all the malware threats in the test. The product achieved the maximum 18 points throughout all the tests – the best possible result. 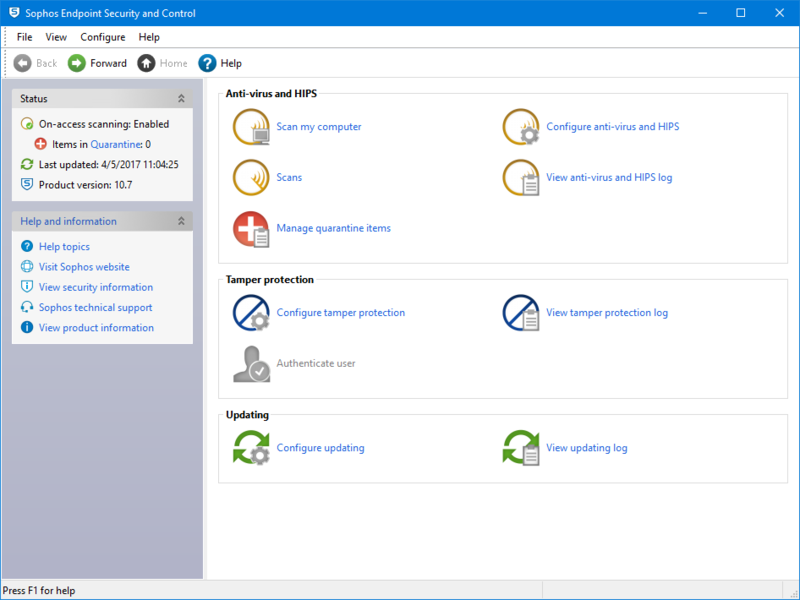 In both phases of the detection test, the Sophos solution always achieved 100 percent. Whenever a solution reaches 17.5 or 18 points in the test, the laboratory assigns a TOP PRODUCT rating, along with a certificate for tested safety. In the current test, a total of 6 out of 13 solutions earned this rating. Both tested solutions from Kaspersky Lab completed the test with the maximum 18 achievable points. 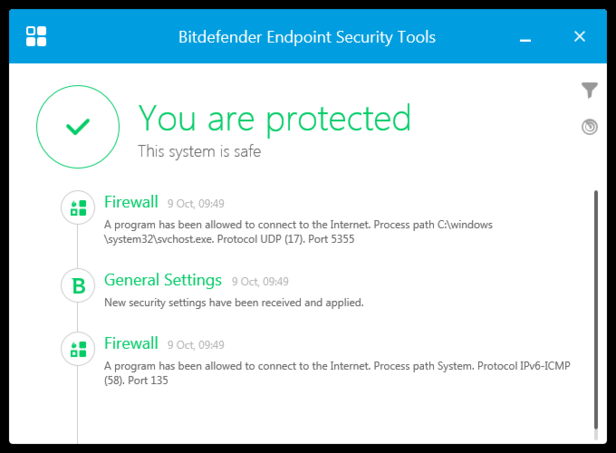 The products from Bitdefender, Sophos and both Symantec solutions earned excellent 17.5 points. The products from Seqrite and Trend Micro still managed to reach 17 points, whereas G Data and McAfee earned 16.5 points each. This was followed by F-Secure and AVG. The last-place finisher in this test is the Microsoft solution, scoring only 15 out of 18 points. 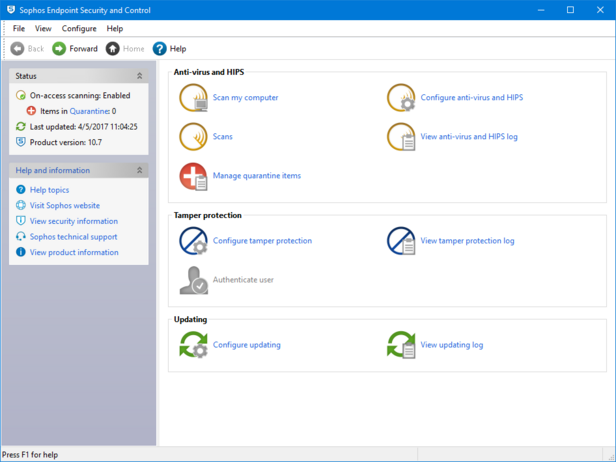 In testing for protection, all solutions were required to demonstrate their quality in detecting malware in two phases. In the first phase – the real-world test – the object was to detect 175 currently unknown malware threats. In detecting these extremely dangerous 0-day malware samples, the solutions had always experienced recurring difficulties over the past few years. 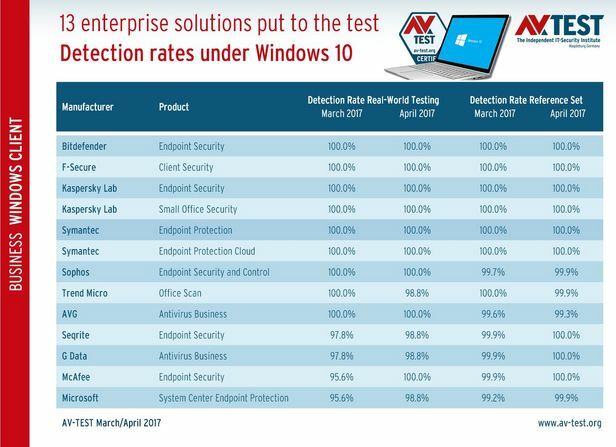 It was a completely different situation in the current test: The endpoint security products from AVG, Bitdefender, F-Secure, Sophos, as well as Kaspersky Lab and Symantec (both with two products each) detected all the threats at 100% in the real-world test. The solutions from Trend Micro, Seqrite, G Data, McAfee and Microsoft committed errors in the detection. In the second test phase – with the AV-TEST reference set – the idea was to detect already known malware samples. Actually a routine task, as the more than 12,000 malware threats are more than two weeks old and thus long since registered. 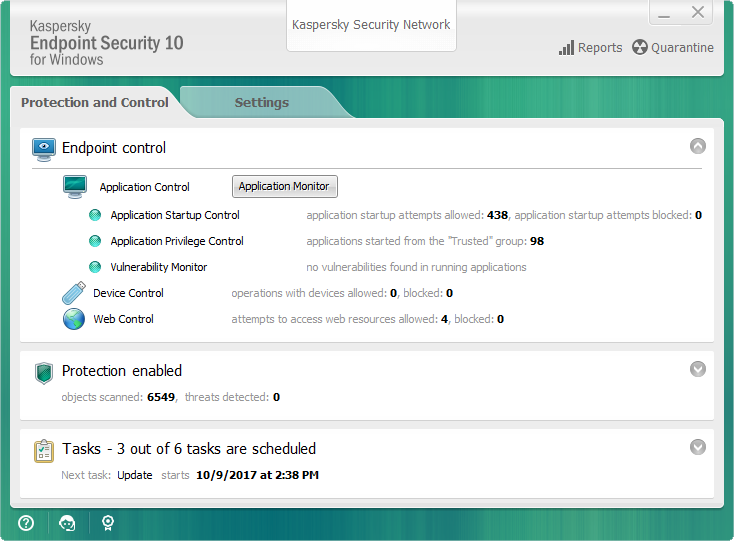 For Bitdefender, F-Secure, as well as Kaspersky Lab and Symantec with all their products in the test, this task was a snap: 100% detection. Malware samples – albeit in just a few instances – eluded the dragnet of all other manufacturers. That should not happen. As a result, a point was taken off here and there. Is the corporate hardware sufficient? In the performance test, the lab tested how heavily the products tax the Windows client PC’s resources and thus could potentially slow down office work. In the test routine, each solution is installed on a standard and high-end PC. Afterwards, the system load is measured while normal procedures, such as program launches or copying routines, were executed. Naturally, each solution was expected to slow down the system a few percentage points, according to the lab. After all, the various protection mechanisms are at work, requiring some resources to do their job. The solutions from Bitdefender, Seqrite, as well as Kaspersky Lab and Symantec (both with two products each) received the maximum 6 points for their measured low system load. Due to a slight, yet measurable system load, the products from AVG, G Data, McAfee, Sophos and Trend Micro received only 5.5 out of 6 points. The solutions from F-Secure and Microsoft were somewhat more conspicuous: only 5 points. Who sounds a false alarm? Each false positive in case of a simple, clean file, can result in a massive amount of support work for administrators in large companies. That is why in its test for usability, the lab evaluated whether the solutions were able to recognize 1.2 million normal files error-free. Moreover, 500 clean websites are visited and dozens of known applications are installed and launched in the test. The best reaction here is no reaction, because that means: no false positives. For the 500 visited websites, that was the case for all the products. When installing and launching known programs, only F-Secure, Microsoft and Trend-Micro experienced one or two false alarms. By contrast, in the scan of 1.2 million program files, an alarm sounded occasionally where there actually should not have been any reaction. This occurred on 1 or 2 files for Kaspersky Lab, Sophos, McAfee and Trend Micro. For Bitdefender, G Data, Microsoft, Seqrite and Symantec (both products), the error rate was between 3 and 10 files. F-Secure had already 11 and AVG even 20 false positives. The results are not dramatic by any means, but it’s annoying for admins when security programs cry wolf. 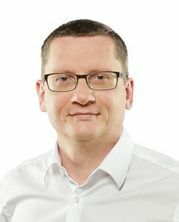 That is why the lab was stingy in awarding the 6 points only to the products from Kaspersky Lab and Symantec, as well as for Bitdefender and Seqrite. The rest received only 5.5 points, F-Secure 5 points and AVG even only 4.5 points. The overall rating indicates that the manufacturers achieve top protection ratings with great professionalism and diligence. This can also be seen in terms of the result, where Kaspersky Lab with 2 products was able to achieve the maximum score of 18 points. Bitdefender, Sophos and Symantec with both products followed with excellent 17.5 points. All four, however, reached the maximum point score in the important category of protection. The midfield at 17 and 16.5 points was made up of Seqrite, Trend Micro, G Data and McAfee. They relinquished a few points in all categories, some even in the vital category of protection. F-Secure deserves special mention, as the solution did a perfect job in terms of protection and thus received 6 points. In final analysis, however, the solution loses in the categories of performance and usability, thus earning only a total of 16 points. In the enterprise computing field, Windows 10 appears to be gaining increasing traction In Europe and the United States, the deployment rate of Windows 7 and 10 is equal at 30 percent each. Differences exist only on a worldwide scale. Some corporate decision-makers who bet on the Windows 10 migration breathed somewhat of a sigh of relief during the last ransomware crisis with WannaCry. While the security gap did exist on Windows 10 as well, the specific exploit code used by WannaCry apparently didn’t work on Windows 10, so there was no infection. Primarily non-patched Windows 7 systems were attacked and the data faced possible encryption. Naturally Microsoft emphatically recommends the deployment of Windows 10 also for corporate users. In terms of security, the system reveals no "old" gaps that originated mainly due to compatibility issues with other software. The modified operating system architecture and new mechanisms are intended to offer users better protection, but it remains questionable whether the actual number of exploits will be reduced. At least the update frequency rate is considerably higher for Windows 10, compared to Windows 7 or 8, for instance. Add to this the fact that with respect to support by Microsoft, the clock is ticking relentlessly: Support will be discontinued for Windows 7 in the year 2020.